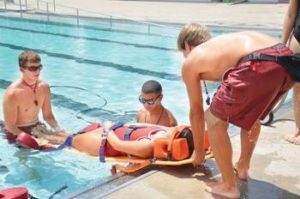 We regularly offer National Lifeguard and National Lifeguard Recertification courses. National Lifeguard is the only nationally recognized Lifeguard designation in Canada. This course extensively covers rescue techniques through lectures, hands-on, and scenario-based learning. Also covered are pool operation and administration, programming information and background, and other related topics. This course is about 40 hours long. The prerequisites are to be at least 16 years old; to have Standard First Aid; and, one of Bronze Cross or Distinction. It is implied that candidates will have at least a reasonable level of fitness. Other courses are planned for 2019. Please contact us if you need dates, or you would like to set one up. If one of these don’t work, we can set up another one. Contact us. This course builds on the skills of NLS and is designed to develop the skills and knowledge needed for waterfront lifeguards. Effective safety supervision in a waterfront environment is different than a pool. NL Waterfront courses will be on the following dates subject to the weather and sufficient registration. This course is $169 if you register before May 6 and $249 after May 6. Prerequisites: National Lifeguard. Candidates are expected to be reasonably fit, and must have the following equipment: wetsuit, mask and snorkel, CPR mask or face shield, first aid gloves, Alert: Lifeguarding in Action manual, NL Award Guide, and Canadian Lifesaving Manual.